This July we are taking a closer look at one of Laura Hecox’s catalog books. 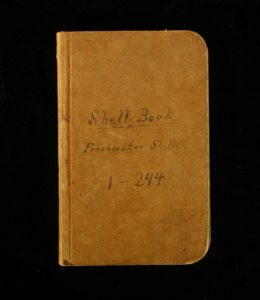 We have several books associated with our foundational collection, and this particular one is a small leather bound volume entitled “Shell-Book Freshwater Shells 1-244”. Although it belonged to our founder, this book came to the Museum accompanied by the cabinet featured in our Naturalist exhibit, which was built by Adna Hecox for his daughter. Due to Laura’s family connections, these items spent many years at the California School for the Deaf Historical Museum before making their way back to Santa Cruz in the early 1990s. We’ve been thinking a lot about the documents in our Laura Hecox collection due to our recent project, the Naturalist’s Scrapbook. In this project, which you can find from the Collections page of the Museum’s website, participants can help us explore digitized news clippings from Laura’s late 19th century scrapbook clippings. Not only do these catalog books and scrapbooks possess historical and scientific value, they are also precious because they are the some of the few documents we have that were made by Laura. We can also use them to think about two different but complementary ways of being a naturalist. Presented by Mrs. R. H.
This entry directly follows the text, which was written entirely in cursive. Following standard formatting for scientific names, we would italicize the name and make the species epithet lowercase, like this: “Bythinella binneyi”. Some items are missing information, and sometimes an item will have a name added in pencil above an ink record, suggesting a continual updating of the catalog. Parallel with Shell Book 1 – 244, we are also displaying a copy of a clipping from Laura’s scrapbook, which came to our attention through the Naturalist’s Scrapbook project. Scrapbooking is a more abstract information-gathering practice than shell collecting, and Laura’s scrapbooks reflect her varied interests, with a strong focus in natural history. Entitled “California Shells. An Interesting Report on Conchology,” the featured article opens by acknowledging that the shells of California have “not as yet been fully described”, and then goes on to detail several specimens, with particular focus on their pretty colorations. It then introduces the collection of a San Franciscan, one Rev. Dr. Joseph Rowell, who had an extensive shell collection and spent several years on collecting missions up and down the Pacific coast in the employ of the Smithsonian. Rowell is quoted in the article, describing his collections, his scientific endeavors, and his opinions on the functions of shell features. Perhaps this article alerted her to the publishing of a new list of shells – given her interest in updating her catalogues for nomenclature, she many have found this to be just the thing. Or perhaps it put new species on her collecting or trading radar – for many of her shells were presented by folks from beyond California to New York and England. Whether Laura considered herself an amateur or a member of the general public, whether she was collecting shells or clipping news, her work reflects two of the many different ways that you can be a naturalist and observe and gather information about the natural world.